This the beginning of IRMA’s coverage of the IAS conference in Rome which opened yesterday, and which is being attended by several IRMA advocates. Via Associated Press, by Alessandra Rizzo. The head of the United Nations AIDS program called Sunday for an increase in access to drugs that help treat or prevent the spread of the disease, saying it is “morally wrong” to keep millions of people off lifesaving medication. Michael Sidibe, executive director of UNAIDS, said the gap in access to HIV treatment should be closed both within and between countries. Sidibe called for better delivery on the ground, a reduction in the number of years it now takes to turn scientific discoveries into actual progress for the poor, and increased cooperation among states, pharmaceutical companies and international organizations. “We must use innovation to overcome social division and inequity,” he said at the opening of an international AIDS conference in Rome. In Africa, the hardest hit continent, 6.6 million people are now on AIDS medication, but 9 million people eligible for treatment are on waiting lists, according to the World Health Organization. In the United States, many state assistance programs that help people access AIDS medications also have waiting lists. 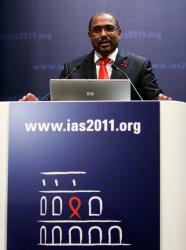 The conference opened a few days after the announcement of a significant scientific breakthrough in stopping the spread of the virus: Two studies conducted in Africa showed that an antiretroviral drug made by United States firm Gilead Sciences already known to help prevent the spread of the virus in gay men also works for heterosexual men and women, researchers said. One of the studies showed the drug lowered the risk of infection for those believed to be regularly taking the pills by roughly 78 percent, the researcher reported. In both studies, participants were also offered counseling and free condoms, which may help explain the relatively low overall infection rate. According to figures provided at the conference, more than 25 million people have died of AIDS-related illnesses since the beginning of the pandemic 30 years ago, and an estimated 33.3 million people are currently living with HIV. Every day, 7,000 people across the world are infected, and more than 4,900 die from AIDS-related illness. Even as conference speakers hailed the encouraging scientific advances, questions remained unanswered: How to make sure people remain on treatment, how to achieve universal coverage and how to reduce the risk of people abandoning condoms? Sidibe said these questions needed urgent answers. And, he added, any discovery must be translated more quickly into policies accessible to those who need treatments, particularly in poor nations. Sidibe also said any trade agreement that would limit access to medication, especially generic ones, should be opposed. Gilead Sciences Inc., based in California, is a major producer of AIDS drugs. Two of its pills — Truvada and Viread — were used in the recent studies conducted in Botswana, Kenya and Uganda. The company has recently agreed to allow a range of its AIDS drugs to be made by generic manufacturers, potentially increasing their availability in poor countries. The conference organized by IAS gathers some 5,000 researchers, scientists, clinicians and public health experts. It runs through Wednesday.